Two weeks ago, Greg and I traveled to Napa Valley for the most epic couples and girlfriends long weekend ever! We joined Katie, Bethanie, Brittany, and Ashlie (plus their husbands and Bethanie’s mama) for all the fun! I can’t even begin to explain how amazing of a time we had. I put together a thorough Napa Valley Travel Guide complete with a vlog! The vlog breaks our trip down day by day, but in the rest of the post, I am going to break it down by venue or activity that we did! It actually is chronological, as well, but I hope that makes it easier to read. If you’re planning a trip to Napa Valley, definitely check out VisitNapaValley.com. There’s tons of super helpful information that will help you plan your visit! Wanted to mention that first, because it totally helped us. Greg and I stayed at the Meritage Resort in Napa, and we were so happy with this property. Everything is what you’d expect – the whole vibe and feel of the resort quintessential wine country. The decor and architecture is very Tuscan, the rooms are lush (and quite large! ), and the property also has an incredible spa, vineyard, and restaurant. They also have a neat bar/lounge area with a bowling alley! We also had a beautiful balcony with a gorgeous view of vineyards. If that doesn’t scream Napa, I don’t know what will. One thing I really wanted to do was visit Cakebread Cellars. It’s my favorite Chardonnay! I reserved a tasting for Greg and I the week before (their tastings are by appointment only). We really enjoyed our time at Cakebread, and it was the perfect way to kick off our long weekend in Napa Valley. I have to say, this and the wine train were my favorite experiences in Napa Valley. If you’ve never done a hot air balloon adventure, you must! We booked our hot air balloon trip with Napa Valley Balloons, and it was first class. You arrive at Domaine Chandon where they serve you some coffee and pastries, and they go over safety precautions and give an overview of the morning. Then you are assigned a van with a group of people and they take you directly to the balloon where you will launch. Did you know that the balloon pilots are graded pilots? It’s a very safe experience with professionals. Once you’re in the balloon, the ride itself just depends on where the wind takes you. Our ride in the air was about 45 minutes. The people below follow you, so once the balloon lands, you can get directly back into the van. They then drive you back to Chandon where they serve a beautiful breakfast with bottomless mimosas. Such a breathtaking experience and a total must if you visit Napa Valley. When everyone arrived to Napa (Christie also joined us this day! 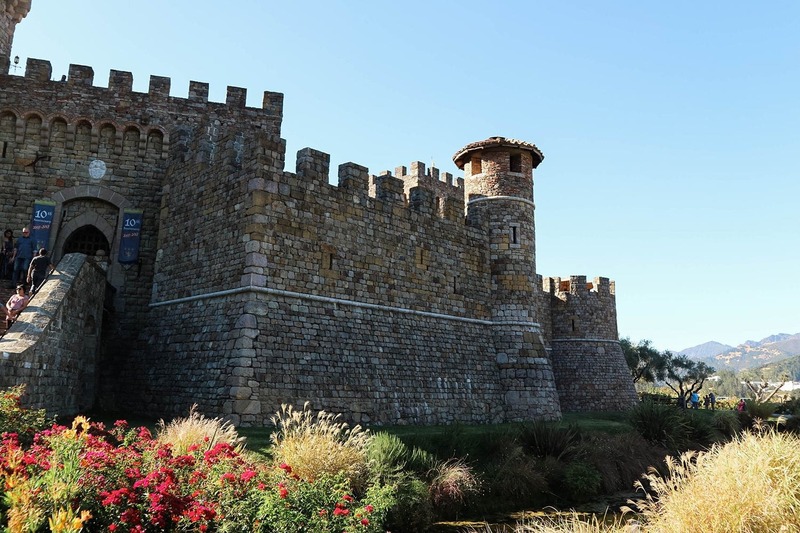 ), we had lunch at Hurley’s in Yountville and then headed out to Castello di Amorosa. After that, we visited Robert Mondavi winery (I don’t think I took a photo there!). The castle was very touristy but a beautiful spot, and so much fun. I’m so glad we went. We all did a tasting together, and since there was so many of us, they gave us a private room. This is another absolute must do when you visit Napa Valley. We decided on a day tour for lunch so we went with the Raymond Tour. We were put on a nice coach bus and took the Silverado Trail over to Raymond Vineyards. We absolutely loved Raymond Vineyards. We were taken on a 90-minute tour and tasting. The grounds are like nothing else in Napa. Outside is very French country and quaint, and inside is so quirky and club-like! After the tour, we took the Coach over to the Wine Train, where we boarded and enjoyed a gourmet three-course lunch while riding the train back to the station. It was so delicious and delightful. There wasn’t a single person in our group that didn’t enjoy the wine train experience! If you get the chance to check out Oxbow Market in Napa, it is so fun! It reminds me a lot of Pike’s Place Market in Seattle, but on a much smaller and navigable scale. We were invited by Live Fire Pizza to enjoy a fun dinner. It was a nice change of pace, as Live Fire is a fun, casual environment. Although the ambiance is more casual, the food is spectacular. We were able to try a variety of appetizers and pizzas, all of which were a foodie lover’s dream. We enjoyed a beautiful dinner outside, plenty of drinks, and the husbands were super happy to pig out on pizza! (Okay, so were we!) We also took a bunch of adorable photos that evening. I promise you we did not plan our color coordination! If a group of bloggers get together and didn’t take pictures, did the trip even happen? Katie was so sweet and gifted us all these tees from Little Hooligans Co. So appropriate for a wine getaway! Before we brunched at the Meritage Resort, we took some cute photos! Bethanie and Katie also surprised us with necklaces from The Silver Loft (use code BABES for 30% off your purchase). One is a puzzle piece with our initials and they all fit together and our home states. These girls are so thoughtful and sweet. I love them so much! You can’t visit Napa Valley without a stop in San Francisco, am I right? I have never been before, and this part of our trip was less than 24 hours! I just wanted to see the city and hit the high points as a finale to our amazing trip. We drove over in our Mazda CX-3 we got to borrow for the weekend. It was the perfect car for zipping around the area. We stayed at the Hilton San Francisco Union Square, which was a gorgeous hotel in an awesome location. The room was super comfortable, on the 23rd floor. We had a great view of the city. We ubered around town and just tried to take in as much as we could in a short amount of time. Needless to say, we were exhausted and didn’t get to do everything we wanted to. But I saw the Painted Ladies and the Golden Gate Bridge (my bucket list items) so I am calling it a win! We ate at Urban Tavern for dinner on property that evening (it was amazing!) and then checked out Cityscape on the 46th floor. It has panoramic views of the city – gorgeous! If we had longer in the city, I definitely would have gotten a CityPass to be able to check out more spots. We got one when we visited Seattle and it was worth every penny! One word of advice – definitely check out sftravel.com when planning your trip to San Francisco. Lots of cool resources to help you plan! We had the weekend of a lifetime. It was great to get away with Greg and spend time with some of my best friends in the whole world. I am ready to do it again! I hope you found this travel guide helpful! I think it’s also important to address the devastation of the fires. While we did have an incredible time in Napa, it’s crucial for us to help if we can. I have been heartbroken watching this all unfold. Anyway, this post on Wine Country Moms Blog is probably the most comprehensive post I’ve found with ways to get involved and help. Please consider helping in any way you can. Thank you so much to The Meritage Resort, Napa Valley Balloons, Napa Valley Wine Train, Live Fire Pizza, San Francisco Travel, Hilton San Francisco Union Square and Mazda for partnering with us on this incredible trip. This looks so fun! I need a vacay! Looks like a great trip!! Looks like a lot of fun! Thank you so much girlfriend!! It was the best time!